Today, I was finally able to walk around Reykjavik without too much discomfort. 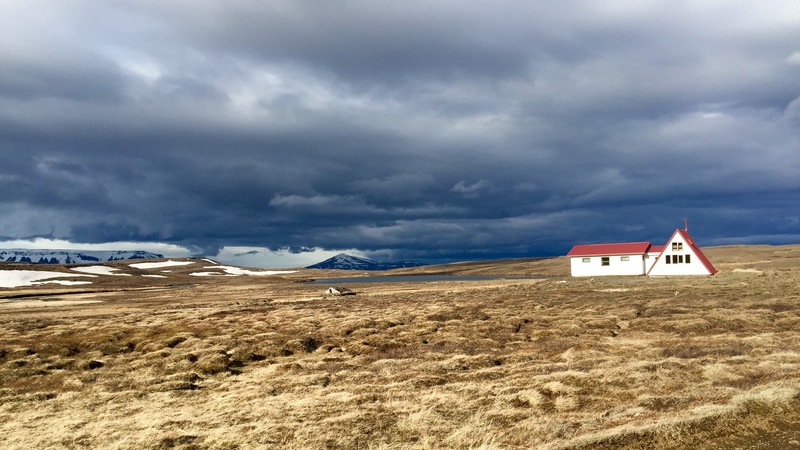 I started having twinges of pain in my from right ankle at the 48-50 mile mark of the first day of my run across Iceland–somewhere north of Þingvellir on Uxahryggjavegur. I hoped, of course, that it would subside by morning, but the ankle still hurt. After unfurling from the back of our rented vehicle after a few hours’ sleep, my wife, Jen, tape-wrapped my ankle and I was off. I opted for my running poles to help distribute my weight. The second day’s first 20 miles were a 10 mile climb up to a pass at over 700 meters on the Kaldidalur road followed by an equally long descent to a checkpoint at mile 30. The long descent from the pass only put more pressure on my ankle–what I’ve come to realize was tendonitis of the superior extensor retinaculum–less than ideal, but still bearable. I decided to shorten the second day from nearly 60 miles to 45, and by the time I reached the 100 mile mark at the end of day 2–a quiet nearly windless camp in the lava fields just north of Eiriksjökull–I *needed* to get off my feet. I’d planned to sleep outside, but after I lay back in the SUV, there was no getting up, and I slept for nearly 5 hours before rousing around 4:30 am. More taping, and protecting the tape with temporary plastic bags in anticipation of my early-morning ford across Norðlingafljót, and I was off again. I knew that most of my elevation gain and loss were behind me–as were most of my trail miles. The road across the Arnarvatnsheiði alternated between rolling jeep road and flat, straight gravel on which I could often see for several miles ahead. I took a few ibuprofen and tylenol, put some music on low, and powered ahead, although my pace steadily declined over the day from 12 to 15 to 17 minute miles, I only thought one time about stopping. And when I did, 20 miles up a gated closed highland road, stopping was not a choice. Instead, after a relatively pain-free morning, my right leg seared with sudden pain as I approached a backcountry hut–still closed and locked for the season. I stopped. I cursed, loudly, and hobbled to a bench beside the hut. I sat there for about 5 minutes, willing my leg to stop throbbing. I realized my next support stop–still some 20 miles away–was getting no closer as I sat there. I realized that I’d been sitting only a few feet from the hut’s latrine. Lovely. Clearly it was time to go. I hobbled back onto the jeep road and aimed myself north–walking, then jogging, then running to the slow rhythmic percussion of my pole tips on the stones. The miles passed–the kilometers passed even more quickly–and by day’s end, after a leg wrenching 400 meter descent to the Austurá river valley–I was overjoyed to see my support team and their news of only 18 miles to go to Miðfjorður and the northern sea. I finished just before 11:00 pm, which in the timelessness of 24 hour daylight could have been anytime at all, amazed, humbled, and ready for rest. One of the conversations I had in the last 15 miles or so with my crew of pacers–among them Michal, Brion, Jill, and my wife & son–was about the role of reflection in experience. I have done little but layer reflection upon experience upon reflection over the past two weeks, and I’ve begun to build a solid foundation for ways to talk about resilience and rebound–my own, our planet’s, and our communities’. I look forward to the challenge of sharing what I have discovered–and what I continue to learn.